Zaev said he expected fresh Greek investments to exceed €500m. 'The Republic of North Macedonia will have huge economic benefits from the deal that I believe will be seen in every area of the economy,' Zaev said. International media outlets reported on PM Alexis Tsipras’ historic visit to North Macedonia today, the first since it was established as an independent state in 1991, with the breakup of Yugoslavia. Indeed, it was the first visit of a Greek PM since the “Republic of Macedonia” was established as part of Yugoslavia. The country’s name was changed to North Macedonia after the Prespa Agreement concluded by Tsipras and his counterpart Zoran Zaev. The BBC reported on the history of the name dispute and the selfie taken by the two prime ministers, which seemed to impress much of the media. “Tweeting the selfie, Mr Zaev referred to ‘happy moments for an even happier future for the peoples of our friendly countries’,” the BBC reported. “The two men signed a series of agreements before holding a joint news conference, in which Mr Zaev spoke of his opposite number as a "close, personal friend", the report added. The Guardian’s report also referred to the widespread popular disapproval of the accord in both countries and that the two leaders are touting the trade and other benefits that they say will result from the normalisation of the two countries’ relations. “The two states’ foreign ministers will also use the occasion to sign a memorandum highlighting the need for North Macedonia’s accession process to the EU to be fast-tracked. Prior to the accord, Greece had vetoed its tiny neighbour launching membership talks with Nato and the EU,” The Guardian reported, cutting AFP. “Greece will be your main ally and protector with regards to political stability, economic cooperation and development,” Tsipras said, describing the visit as ‘historic’,” the report added. 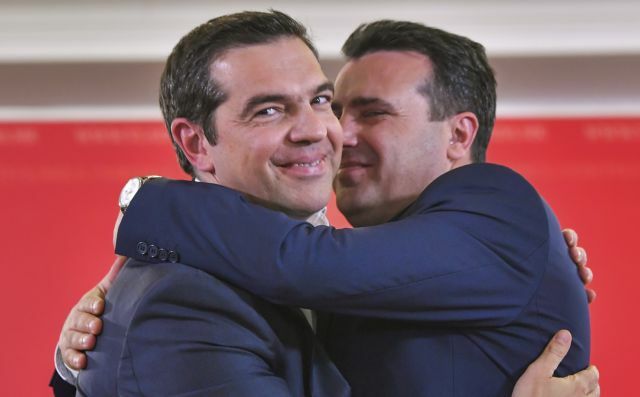 The French news agency Agence France Presse (AFP) carried the story with the title “Historic visit of the Greek Prime Minister to North Macedonia”. “On his (Tsipras’) trip, the first official visit to Skopje of a Greek leader since the proclamation of the independence of Macedonia, Alexis Tsipras is accompanied by ten ministers and dozens of businessmen from the agribusiness, energy and infrastructure. The two leaders intend to prove that the economies of both countries will also benefit from this agreement, which ended a political quarrel that lasted nearly three decades,” AFP reported. The French newspaper Le Point also described the visit as historic, while the Swiss press agency SDA focused on the two leaders’ push to demonstrated the economic benefits for both sides of ending a dispute lasting over three decades. The German press agency DPA in a report entitled “Greece's Tsipras on historic visit to North Macedonia” also noted the popular opposition to the Prespa Agreement on both sides. “Tsipras is the first Greek prime minister to visit the neighbouring country since Macedonia was established first as a federal Yugoslav republic in 1945, then as an independent country in 1991. He arrived less than two months after Macedonia agreed to rename itself to North Macedonia on February 12, ending a long-running diplomatic row,” the report stated. The Washington Post also spoke of an “historic selfie” and the AP wire it used noted that Tsipras is accompanied by 10 ministers and business leaders and that the two sides signed trade and defence agreements.